Leo’s life is running according to everyone else’s plans until he finds a mysterious book in the snow on his way home from military school late one evening. It is a blank book that fills its pages with the story of a distant relative, exiled from Malonia. With the war at the border and a severely ill relative, this orphaned boy finds his life fatefully intertwined with another dimension and another life. The Eyes of a King opens much like the Russian story of the Royal Family and the lost daughter of Nicolas Romanov, Anastasia. The dystopian, pre-industrial society on the brink of a war and a revolution does not affect Leo much until he loses someone close to him. The 15 year old boy before the death of this loved one, and the 15 year old boy after, are worlds apart. Banner slowly lets the reader become familiar with Leo and what’s left of his family in such a way that you do not even suspect that you’re falling in love with the vivacity and honest nature of the character who dies. The pathos and emotional connection allows readers to empathize beyond measure the grief, shame, anger, and self-doubt Leo transitions through. The clarity of this transformation and believably of passion, and loss of hope makes readers wonder what tragedy could have befallen the 14 year old girl who penned this novel. Reading through the first half of the book, the plot and style felt slow and tedious. This was before the realization came that Banner was not writing a traditional fantasy story, but a fantasy-memoir. This understanding opens the mind to the notion that life does not need to be full of action and adventure to keep an audience interested; rather it allows for this character-driven tale to unweave as it was meant to – the way real life feels. The events that take place are not grand: Leo does not get along with his instructors at school, he argues with his Grandmother on a daily basis, he flirts with the new girl who moves into his building, and does his best to teach his younger brother what his absentee parents should have. The background of the war on the border, the military rule of his homeland, and the idea that the young prince may not have been killed during the hostile take-over 10 years prior compliment the myth of England and the idea of magic in a parallel dimension. 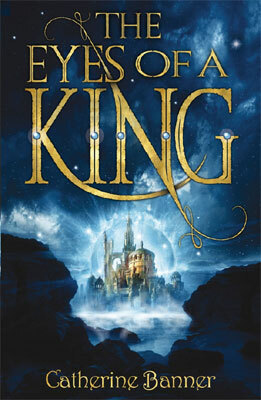 The Eyes of a King is a story written at three different stages of Leo’s life with corresponding font changes to keep each strain of the tale separate. By the end of the book, Banner brings together each strand in a non-traditional way – there is no perfect ending to this tale of sorrow and strife. It is a hard look at the reality of two worlds not so very different, peopled by souls living under the same sky. The hard and gritty edge Banner brings to this understanding of life rubs raw all ready frayed nerves, with the dominating theme of ‘what is it to survive?’ extinguishing nearly all hope of a happy ending. As the first book in a trilogy, I wonder where Banner will take her readers next as her characters continue to scratch out an existence in this dystopian tragedy.